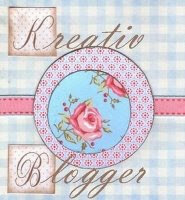 Bits of My Own: Kreativ Blogger Award! Imagine my surprise to find out I have been nominated for this award by Helen from Stitchery Nook! I understand that now it is my turn to nominate 5 others whose work inspires me. Congratulations on getting this award Erica. Your 'Tis the Gift WIP is looking gorgeous.